WOMADelaide has released the final 40 acts in its 2019 line-up, with highlights including Malian singer Fatoumata Diawara, Australian singer Thelma Plum, and French group The Original Gypsies – featuring members of ’80s band The Gipsy Kings. The full program for the March 8-11 festival in Botanic Park will comprise more than 600 artists (across 69 groups) from more than 40 countries, including previously announced headliners Angélique Kidjo, performing songs from her re-imagining of Talking Heads’ 1980 Afrobeat-influenced album Remain in Light, and French pop group Christine and the Queens. Newly announced act The Original Gypsies, which will perform on the closing day, was launched earlier this year after four members of The Gipsy Kings reunited after 20 years. The touring group comprises 15 musicians – including 12 guitars – performing what WOMADelaide organisers describe as “fiery rumbas and furious flamenco”. Mali singer, actress and social activist Fatoumata Diawara gained a strong following for her debut 2011 album Fatou, which featured musicians such as Toumani Diabaté, and will appear at the festival on both the Friday and Sunday. She recently released her second album, Fenfo, which includes songs ranging from “cool, melodic Afro-pop” to “stomping funk”, according to a review in The Guardian. Australian acts added to the line-up include folk musician Thelma Plum, Mojo Juju (who played a gig at Adelaide’s Jive last week on the back of new album Native Tongue, which has seen her nominated for three ARIA awards), Melbourne funk-soul group The Bamboos, and Adelaide’s Zephyr Quartet, Ukulele Death Squad, Timberwolf and Ollie English. Among the other international artists are ’90s indie-rock singer Liz Phair (whose 1993 debut studio album Exile in Guyville was ranked by Rolling Stone as one of the 500 Greatest Albums of All Time), UK electro-swing duo The Correspondents, electronic rockers DuOud (Tunisia/Algeria), jazz harpist Alina Bzhezhinska Quartet (Poland/UK), West African kora player Sona Jobarteh, Dutch-Kiwi group My Baby, and UK DJs Leftfield and DJ Harvey. 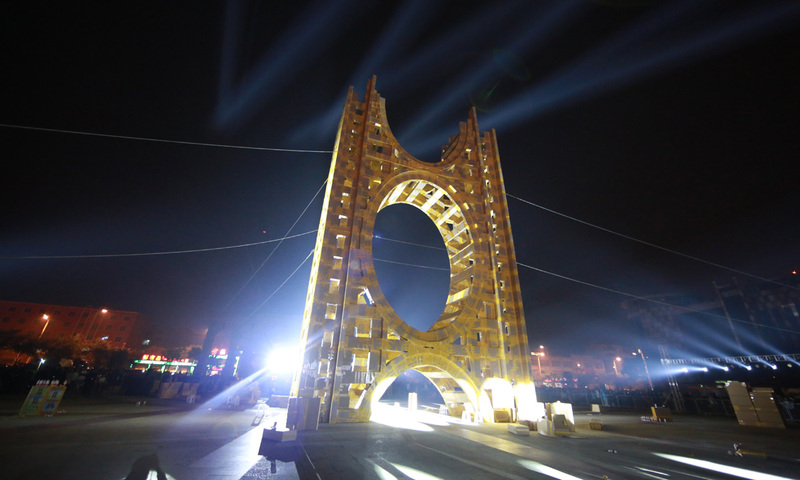 Over the festival weekend, French installation artist Olivier Grossetête will create a monument described as a 20m-high “colossal cardboard archway”, with help from audience members and students from the new Adelaide Botanic High School. Ephemeral City – one of Olivier Grossetête’s creations. The full line-up festival line-up for 2019 is available on the WOMADelaide website.